Lisa Highfill is an Instructional Technology Coach in the San Francisco Bay Area. She earned her masters in Educational Technology Leadership and has been a classroom teacher for over 20 years. 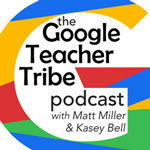 As a Google Certified Innovator, and a YouTube Star Teacher, she travels the country presenting at edtech conferences and speaking about lesson design and learning theory. Lisa is the co-creator and co-author of The HyperDoc Handbook. Google “Spark”: I was in the Merit Program, led by Rushton Hurley. The program completely changed me as a teacher, my knowledge of technology, and how to best combine the two. Favorite Google Tips and Tricks: Google Slides make great portfolios for all of your graphic design work. John Hartmann (St. Louis) -- Name a version in the revision history. Sets up a template (Sheets, slides) and names it master. When students complete the task, can revert back to the master and use it over and over. Doesn’t have to reinvent the wheel. Jake Miller (Ohio) -- Thanks for creating community. Google Translate in Google Sheets. Does more than math. Type =GoogleTranslate you’ll get a formula to take words in one language and translate to +100 language. Useful for ELLs. to the native language. Can use Flippity.net to turn into flashcards to practice. JakeMiller.net search for translate for GIF.